More than 100 million Americans live in communities with unhealthy levels of air pollution. Air pollution consists of harmful or poisonous substances in outdoor or indoor air. Air pollution is harmful to people even if they do not have lung disease, but it is particularly dangerous for people living with asthma, COPD, and other respiratory ailments. Despite progress in recent years, air pollution continues to be a serious environmental and health problem. The Chicago metropolitan region continues to violate federal air quality standards for harmful ozone and particulate matter pollution. The U.S. Environmental Protection Agency also ranks poor indoor air quality among the top five environmental risks to public health. Due to the health effects of air pollution, Respiratory Health Association is working to reduce it through education and policy change. How Does Air Pollution Affect the Lungs? How Do I Protect Myself From Air Pollution? Ground level ozone smog, commonly referred to as smog, is formed by a chemical reaction between volatile organic compounds (VOCs) and nitrogen oxides (NOx) in the presence of sunlight. VOCs are organic compounds that easily become vapors or gases, such as engine exhaust. NOx gases are produced from the reaction among nitrogen and oxygen during combustion. One of the largest producers of NOx gases is vehicle engine fuel combustion. Ozone concentrations can reach unhealthy levels when the weather is hot and sunny with little or no wind. Unlike upper atmosphere ozone, which occurs naturally and is beneficial because of its protective qualities, ground level ozone is a manmade air pollutant that can have harmful effects on both humans and the environment. Daily ozone levels are typically highest in the evening and lowest around sunrise. Fine particulate matter, called soot, refers to tiny particles or droplets in the air (nearly invisible to the naked eye), usually a by-product of combustion, such as auto and diesel exhaust, power plant emissions or wood smoke. Soot can reach high levels under the same weather conditions as smog. It can also occur at any time of the year when dry, calm and clear conditions can allow particle pollution to concentrate. Soot reduces visibility and causes the air to appear hazy when levels are elevated. Breathing in air pollutants can irritate your airways and may cause shortness of breath, coughing, wheezing, asthma episodes and chest pain. Exposure to air pollution puts you at risk for lung cancer, heart attacks, stroke and in extreme cases, premature death. 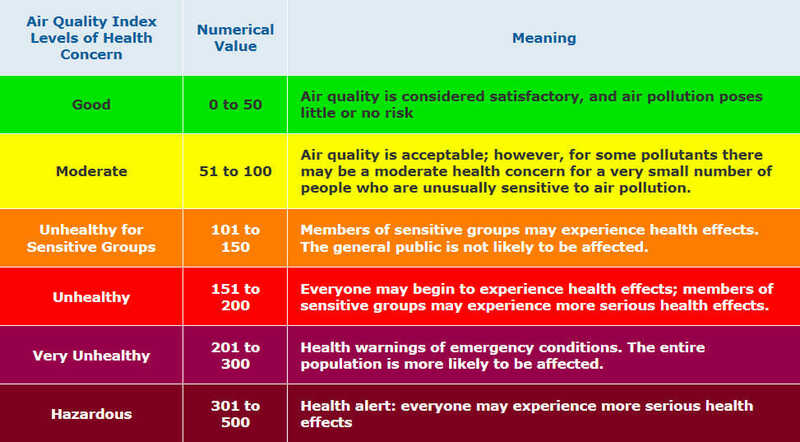 The U.S. Environmental Protection Agency monitors air pollution through a color-coded system called the Air Quality Index (AQI), shown below. It scales air quality from 0 to 500. An AQI value of 100 generally corresponds to the national air quality standard. Higher AQI values indicate greater air pollution levels and corresponding health dangers. Find out how to protect your health and improve air quality when state and federal environmental agencies forecast unhealthy air quality.